Thelma Jones, 98, of Rising City, died Wednesday, December 21, 2016, at david place in David City. 7 grandchildren, 12 great grandchildren, 5 great great grandchildren. Sisters-in-law: Irene Olson, Lois Bowman, Pat Brooks, brother in law Bob Jones. 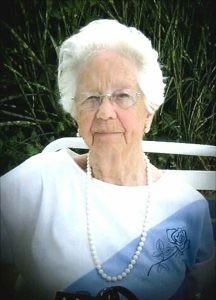 Thelma Evelyn (Olson) Jones, 98, Rising City, NE died peacefully in her sleep on December 21st, 2016 at David Place Retirement Home in David City, Ne. following a lengthy illness. She was born January 24th, 1918 on the Olson farm seven miles south of Geneseo, North Dakota to Selma (Knutson) and Martin Olson. She attended primary schooling at Woodlake School in Marboe Township of Sargent County for eight years, attended Rutland, ND High School for one year and completed high school at Veblen, SD High School where she graduated in May of 1938. She was the only one out of 14 children to graduate. On October 17th, 1938 she was united in marriage to Clyde Stewart Jones in Sisseton, South Dakota whom she met while he worked on their family farm. Their marriage was blessed with a daughter, Betty Lou and an adopted son, Duane Lee (Buck) who they cared for as their very own. Thelma and Clyde at the beginning of their marriage lived with Thelma's folks and her large extended family before moving on to farm in other areas in North Dakota. They moved to Wahoo where they worked at the Mead Defense Plant helping with the war effort until the plant closed following World War II. In 1945 they moved to Rising City, NE where they bought and operated Clyde's Tavern. They sold their business after 13 years of operation. Thelma then went to work at the Farmers State Bank as a teller and remained there until retiring in 1983 after working there for 25 years. During retirement Thelma along with her husband enjoyed many trips back north to the Dakotas and Minnesota for family visits. She may have been a Jones by marriage but always remained an Olson at heart, true and strong. Thelma was an active member in her community. She was a member of First Lutheran Church where she participated in Women's Circle, the Women's Quilting Group and attended church services on Sunday mornings. She was a member of the Rebekah Lodge, S.O.S., Cornhuskers, Over 60's and Keen-agers groups. Although community involvement and activities were important to Thelma her true passion was family. Nothing brought more joy to her than a family gathering or a new baby in the family.Thelma especially loved the children and was drawn to being near them at family gatherings and we know this is because she herself was a child at heart. She loved a good game of Scrabble, dominos or cards with friends and family. She had a love for music and could be found playing the piano, singing to herself or watching a musical show on TV all the while singing, dancing, tapping her toes or clapping her hands. Thelma was a very hospitable person and opened her doors with loving arms for people to come in. This was evident by all the cards and letters she constantly received that were her pride and joy. Summers were spent having family come and stay with her in her warm and inviting home. She had a positive outlook on life which was contagious to all who came in contact with her. Thelma had a loving heart and had a knack of making each one feel special. Those of us who knew her and loved her will miss her hugs and her spoken expressions of her love for us all. Survivors include her son Duane (Buck)(Jean) Jones of Neligh, NE; seven grandchildren: Barry (Debbie)Decker of Lansing, MI, Patrice (Jim ) Balmer of Dansville, MI, Angie (Doug) Knauf of DeWitt, MI, John Decker of Lansing MI, Cassie (Dan) Tillis of Neligh, NE, Carly Whitney (Nick) of Columbus, NE and Colin (Chelsea) Jones of Columbus, NE; twelve great-grandchildren: Amber Rodriguez (BJ), Levi Decker, Naomi Simpson (Steve), Nicolas Knauf, Nathan Knauf, Natalie Knauf, Nolan Knauf, Brooklyn Ederington, Jersey Jones, Kynlee Tillis, Ashlyn Tillis, and Rhonan Whitney; five great-great grandchildren: Savannah Rodriguez, Dominic Rodriguez, Brody Rodriguez, Julian and Ryan Simpson, several nieces and nephews, sister in laws Irene Olson, Lois Bowman, Pat Brooks and a brother in law Bob Jones. Thelma was preceded in death by her parents; her husband, Clyde Jones, her daughter, Betty Jackson, an infant son, her siblings and their spouses including her twin sister Selma Elinor who died in infancy and a dog named Blackie.